This Section of Epidemiology and Psychiatric Sciences appears in each issue of the Journal and is dedicated to all forms of creative production born of an intimate and individual urge, often secretive, unbound from the conventional art system rules. Through short descriptions of the Outsider art work of prominent artists and new protagonists often hosted in community mental health services, this section intends to investigate the latest developments of the contemporary art scene, where the distances between the edge and the center are becoming more and more vague. The Age (2009). Metro Arts and Culture. http://www.julianartist.com/articles/article03.html. Daye, C (2009). Draw: A Portrait of Julian Martin. 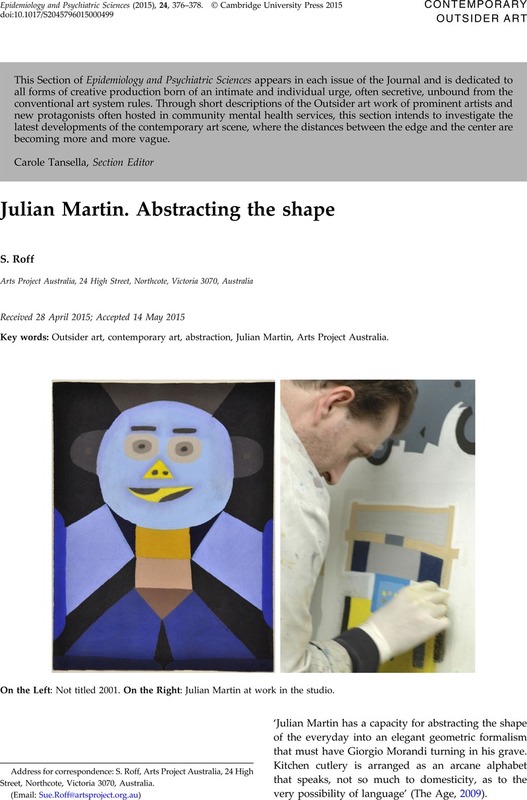 http://www.julianartist.com/articles/profile.html. Lester, L (1997). Art of Communication, The Age. http://www.julianartist.com/articles/article01.html.